The video series is the latest addition to NDEP’s offerings in lifestyle change. The videos are being released to coincide with the redesign of NDEP’s online library of behavior change resources, Diabetes HealthSense. 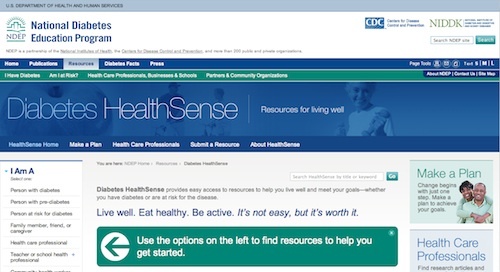 Diabetes HealthSense provides users with a searchable database of research, tools, and programs to address the wide array of psychosocial and lifestyle-change challenges associated with diabetes self-management. Resources included in Diabetes HealthSense have been reviewed by a team of leading independent experts on psychosocial issues with specific expertise in the science of behavior change. For more than 14 years, the NDEP has been in the forefront of raising awareness about diabetes, but more needs to be done to provide resources and tools to support health care providers and their patients when it comes to achieving and sustaining health goals. Additionally, visitors can choose what they’d like help with, such as how to cope with stress and emotions, eat healthy, or be active. They can also utilize tracking tools for calories or physical activity, or online programs to help them manage their weight or stop smoking. It’s common to feel overwhelmed, sad, or angry when you are living with a chronic disease such as diabetes. A person may know what to do to improve their health, but figuring out how to do it can be one of the biggest challenges. For example, people know that being physically active can help them lose weight. But do they know how to take the necessary steps to become more physically active and keep it up over time? Diabetes HealthSense includes links to tools and programs to help people set goals and find ways to deal with the stress and emotions that can prevent a person from achieving their goals — whether they have diabetes or are at risk for the disease. NDEP is jointly sponsored by NIH and the Centers for Disease Control and Prevention. NDEP works with more than 200 partners and offers materials and resources to the general public, people diagnosed with diabetes, and health care and business professionals. NDEP resources are available at www.YourDiabetesInfo.org or by calling toll-free 1-888-693-NDEP (1-888-693-6337). The NIDDK, a component of the National Institutes of Health (NIH), conducts and supports research on diabetes and other endocrine and metabolic diseases; digestive diseases, nutrition and obesity; and kidney, urologic and hematologic diseases. Spanning the full spectrum of medicine and afflicting people of all ages and ethnic groups, these diseases encompass some of the most common, severe, and disabling conditions affecting Americans. For more information about the NIDDK and its programs, see www.niddk.nih.gov. CDC’s Division of Diabetes Translation works to reduce the preventable burden of diabetes through public health leadership, partnership, research, programs, and policies that translate science into practice. For more information, see www.cdc.gov/diabetes.